I am always inspired by debt payoff success stories! I love reading about the sacrifices people are willing to make to get out of debt. I especially love reading the success stories of my blog readers because I feel like you are all “my people” and we get each other. Today, while I’m unpacking boxes in our new (and internet-less) house, I bring you the debt-free story of Megan and Colten! Take it away Megan! Our debt payoff “project”, as we like to call it, started when I asked my husband when we could start our family and, thus, quit my job and stay home. At the time, we had $120,000 in student loan debt that cost us a $1300 payment each month. That payment was more than our mortgage and was a big bummer when payday came around! My husband, Colten, responded that we could start a family at any time, but I was to remain responsible for my $600/month payment. I immediately put a pen to paper and tried to estimate what that meant for a debt payoff timeline. I hoped I had approximately ten months (Lord willing we would be able to get pregnant) to get my debt down as much as I could! It wasn’t long before I realized we could cut our spending in both major and minor ways! First to be eliminated were clothes shopping, eating out, and impulse spending. I remember the beginning was so easy because we were so excited and quickly realized how much we could save right off the bat. We saved $50 a week just in restaurant bills! That number will haunt me forever. Then, we began forming weekly grocery lists and purchased only the necessities for the week at our local Aldi. When I say necessities, I mean even coffee and orange juice were cut! I perused the local Dollar Tree and began buying soap, shampoo, conditioner, dishwasher soap, and any other necessities I could find there for $1. Next, we tried to avoid spending. We stopped using our dryer, I kept my old phone, and quit expensive gym memberships. We went without paper towels, we consolidated errands to avoid wasting gas, and we stayed in our older (and often faulty) cars. Colten and I thought we really had something going, but the best was yet to come! I found at-home employment that eventually bolstered our take-home pay by about $1,000 a month! Colten also worked part-time as a consultant at his day job for another $1,000 a month! Am I making it sound like we were really having a great time paying off our debt? I didn’t always enjoy staying up until midnight doing my part-time work when I had “real” work in the morning. And it wasn’t easy to have the weekend come, only to have Colten go into work Saturday. But, our debt was going down and we told ourselves to be patient. And we made it a point to thank each other for the hard work we were doing. What could have potentially been a real bane on our marriage became a great exercise in teamwork. I would avoid buying coffee over my lunch hour because I knew how hard Colten had worked to earn that money for us. And I know he felt the same. Colten and I learned a lot throughout the two years it took us to pay off our debt. Foremost, whenever our payoff process and spending, or lack thereof, were discussed, some people would praise us as though we were doing something extraordinary. They would make statements about how they wish they could pay off their loans, but, instead, they have eight more years to pay them off. The thing was, we were not doing anything that somebody else couldn’t do! Anybody can find ways to save money! We were not special! Furthermore, and sadly, we did not always feel supported by friends and family (luckily I followed several blogs of like-minded people!) People close to us would often get irritated when we wouldn’t join the baby pool, didn’t go on a shopping trip, or, didn’t have much to add in a discussion of building houses. For some reason, talking about a budget really made people uncomfortable! Lastly, I think we realized what was important to us. We quickly discovered we didn’t need to go out to eat every Friday to treat ourselves. I don’t need a new dress for every wedding I attend. And we can have a starter home and old cars right now even if our friends don’t. Colten and I welcomed a son in January 2016. We managed to pay off our $120,000 in student loan debt in 26 months. When I initially sat down that first day with my pen and notebook, I had estimated that we could have my part of the loan ($60,000) paid off in October 2016. Boy, was I wrong! Our last payment (on both loans) was August 2016! We were shocked by what we were capable of doing once we put our minds to it! You bet I quit my job as soon as I could and have loved staying at home with our son. We’re even adding another one to the mix in May of this year! Thanks for reading our story and I hope it inspires you to take control over your debt! What’s the most extreme sacrifice you’ve made to pay off your debt? Megan is a 30-year-old married, stay-at-home mom with a 1-year-old and a baby due in May. She’s a resigned mental health therapist. Her husband Colten is a mechanical engineer. They live in Wisconsin. Congratulations! You did an amazing Job! For us the biggest sacrifice is not seeing our inlaws. Between school and then moving to be near my family my husband hasnt seen his family in ten years. They have never met our daughter. So our first vaction once we are debt free will be visiting my inlaws. Thanks so much! It really does take a lot of sacrifice, but visiting family is an awesome goal to keep you motivated towards your debt-free goal! Ten years is a long time! 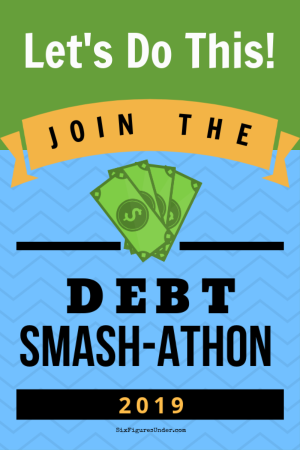 Hope you’re really close to being debt-free! Thank you! Yes, so often, unfortunately. I can think of so many times when family wasn’t supportive. One member asked us to “please, quit talking about your finances”. Which got me thinking, what if I had a goal that was ‘normal’ to talk about? Would you support me then? And a lot of the time it felt like they just pretended our debt payoff wasn’t happening. Like you’re saying, they’d still want us to join in for gift exchanges, showers, etc, and wouldn’t understand when we’d say no. So, yes, I get what you’re going through! Hopefully they come around soon and understand more of what you’re doing! Congratulations! My husband and I are also in a debt free journey with $115k in debt, most of that being student loans. We are in the very beginning of being intense about our debt payoff so reading stories like this is extremely uplifting. We, too are finding the mixed of super support from people and a lack of support from people. The most frustrating for me is that people assume that because we are on a budget that we are broke. Not the case. We are just choosy and particular about where we spend the money. Thank you! I always loved hearing success stories, too! Yes, budget = poor. We had that same experience! Like the time my mom brought us old chicken because…well…you’re…We’re what, Mom? We’re poor and have low standards and will eat anything?! It seems like people think a budget is constricting. We thought a budget was quite freeing and took up a lot less mental space. I checked out your blog and your intro made me burst out laughing! Good luck with your payoff! Great work. Thanks for sharing your story. Here’s looking to even better things ahead! What kind of work did you do for your at-home job? Although we are out of debt, we are retirees and our income is in dire need of a boost. $1000 a month could mean the difference between homelessness and having a roof over our heads! Thanks. Hi CS – I did something similar to closed captioning, but I wasn’t live on TV. I would download a video and had a night or two to caption the project into a Word document. If you’re a skilled typer or patient and meticulous, you’d be great at it! I was paid $1.20 per captioned minute. Hope that helps! I hate to be the negative Nancy but it really bothered me that she spent $60,000 on her education and then didn’t use it. As someone who spent money on an education, there is nothing wrong with dedicating time to your family when they are young. I had the opportunity to do that and had my four surviving children in six years; I returned to work part-time when the youngest was school-aged. Now I’m working part-time and can still balance the needs of my family with my job. I think that it’s wonderful that she isn’t saddled with debt payments and trying to be a part-time work from home mom! Good job! Why would it bother you. You didn’t pay for her education and it doesn’t impact you if she stays home. A degree is something that no one can take away from you, so when she decides to go back to work she still has it. Someone can use the same argument to say she had that kid, put him in daycare and didn’t bother to raise him. That’s highly offensive. Parents are always going to have the biggest influence over their children’s lives, whether or not they’re in day care. A child being in day care does not mean that the parents “aren’t bothering” to raise him. Of course not Becca. You missed the point. The point is that people will criticize any action you take. Stay at home and “waste your education” or go to work and “neglect your kids.” I was providing a counter point to the other poster who was upset Megan wasn’t “using” her college education. I am a working mom btw and AM very active in my kid’s life. Even though I work I would never judge a parents desire to stay at home with their children. And I don’t let people’s opinions shape how I choose to live my life. I completely agree with everyone else on this thread, she didn’t waste her education or $60,000 just because she chose to be at home with her children. I had over $150,000 of loans and I decided to stay at home with our children and homeschool them but I didn’t waste my education and neither did she. Education is not just about the degree title but about the skills that you learn along the way. I usually don’t comment on things like this, but your comment about not using her education to raise a child makes me think that maybe you’ve never had children? I got a degree in finance from a very reputable business school, and then stayed home to raise my 6 children. An education elevates and expands a person’s capabilities and capacity to learn, no matter what their chosen life path. Raising a family is like no other work a person can do. It will draw upon every last resource you can find within you. This writer is young, and there is no telling what life will bring her way, and how she will chose to use her formal education. If she never enters the workforce again, she will still be engaging in the most important work in the world. I have never regretted my choice to be a stay-at-home-mom. Anyone can be trained to do the world’s work, but no one will ever love and care for children as well as their own parents! Hats off to this offer for prioritizing staying home with her children, and making the sacrifices necessary to make it happen. It is obvious God blessed you for your efforts. Such and encouraging story! It’s true what you say about needing an online network to reinforce your goals. We have friends who are still purchasing vacations and digging deeper into debt even though they already have $100,000+ in student loans. It’s hard to see that and still be pressing on. Having that group of like-minded people saying that no, we are not okay living in debt all our lives, makes all the difference. Congratulations! But I hope your husband was just joking when he said you could start a family anytime, but you were still responsible for your debt. Marriage is a partnership. For better or for worse, in sickness and in health, for richer and for poorer – it’s one of the key vows there. I have a good friend whose husband didn’t believe their marriage was a partnership. When things went south (and all marriages have rough spots) he bailed; and she struggles to get any child support off him, because “I never wanted the kid, you’re the one who wanted him, you can pay for him.” So for me, it’s a big red flag when I see one partner saying something like that. You might have created that debt before you were married, but as soon as you took those vows, it became his debt (and his responsibility!) too – legally and morally. Thank you for speaking to this. It was a big red flag to me too. I understand that a lot was condensed in this story but the statement, “My husband, Colten, responded that we could start a family at any time, but I was to remain responsible for my $600/month payment. ” really was disturbing. I am glad I wasn’t the only one that raised my eyebrows at that statement. Great job Megan! We have such a similar story to yours! I also worked for a few years while I really wanted to be a SAHM before we paid off enough debt I could stay home! We’ve also definitely had family members resent us fo not participating in gift exchanges, or going out to eat all the time, etc. The example you are setting for your children is awesome! They will learn money habits from you guys and that makes their future great. Good for you. There is not a price you can put on education, you are better for it and so are your children. I wish for you all the best. I am so happy to hear you tell how you planned your family & financially prepared for it. I know many folks, especially single parents, who don’t have the option to stay home with their babies. I’m old fashioned enough to believe that children should spend their early years with parents & family whenever possible. The plan & the budget should come first; then the baby. There’s plenty of time to use that degree later but you’ll never get that time with your babies back. My granddaughter told me last week that they couldn’t afford to have their 3-year-old’s teeth worked on & in almost the same breath said they paid $250 a month for their phone plan! We’ve started doing what you are doing. Problem is that my career is in the Bay area, so we have to work around a 2545 dollar rent. We’ve paid 54000 on my student loan since last August. My wife and I do not live together, as a matter of fact we live in different states. She has a business in Oregon but will move down with me in June. I’ve taken advantage of living alone, living out of my car for 5 months to escape paying rent. I got my mail at the UPS store, showered in a 24 hour fitness, and kept my food at work. I bought a mini fridge and a microwave for the office so I’d have some way to prepare breakfast and lunch. I bought a small cook stove to cook dinners in local parks. It wasn’t easy and it still isn’t, but I think it will take us about 24 months as well. Our strategy is to find a way to move to a small country town, working for the same company in the same line of work, to free up 1500 a month in rent for the mission. Thanks for sharing your story, it IS encouraging! This is an amazing story :). I love hearing debt free stories. It’s so inspiring! Does the guest post writer have a blog we can refer to? Great writing and awesome story. P.S. education is education and life long learning of any kind is irreplaceable. So, to each their own but a degree is a valuable tool to anyone and may be needed in the future!